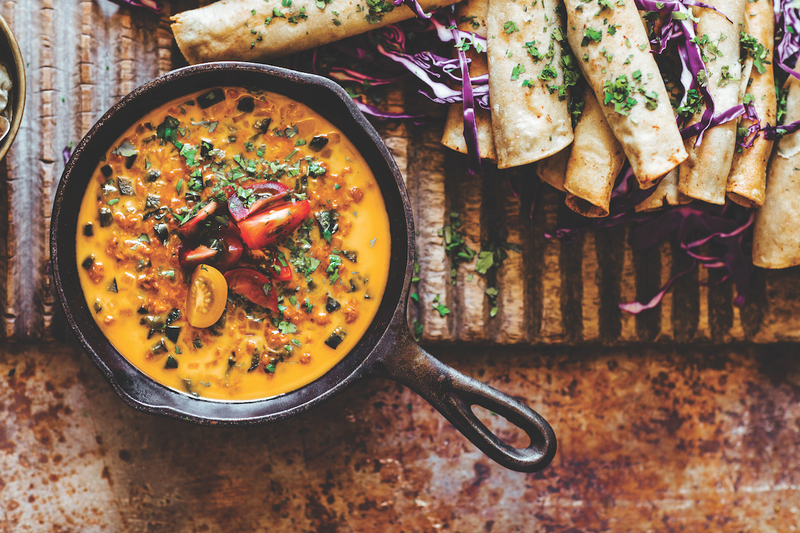 Warm, gooey deliciousness is yours with this Mexican fondue, which is best served with gluten-free tortilla chips and perhaps roasted vegetables for dipping. To keep this fondue hot, serve it in a fondue pot or reserve it in its larger skillet over low heat but serve it in a small cast-iron skillet, refilling as needed. Heat an 8-inch cast-iron skillet over medium heat. Add the onion, chile, and chorizo. Stir, breaking up the chorizo into small pieces. Cook, stirring occasionally, until the chorizo is browned and the vegetables are tender, 8 to 10 minutes. Add the beer and stir, scraping up any brown bits from the bottom of the pan. Turn the heat to low and add the cheese a little at a time, stirring constantly until all the cheese is melted and smooth. Season lightly with salt and pepper. Remove from the heat, sprinkle with chopped tomato and cilantro, and serve immediately in the pan or transfer to a fondue pot with a tea light and keep warm. Serve with whatever you'd like to dip into it, perhaps roasted vegetables and tortilla chips.